Recently featured in a viral Bored Panda video highlighting “patience and precision,” a collective of artists founded in 1879 called Kutani Choemon paint gorgeous designs on ceramics with such detail that viewers are left feeling calmed and inspired by their graceful designs. According to their Instagram page, they’ve “been making tableware and tea ceremony utensils for over 135 years in an integrated system of production from material to products.” Their traditional designs are complemented by their old-fashioned methods of painting the ceramics. In the video below, the artist starts by making measurements before painting on a pattern that embraces natural and man-made designs. 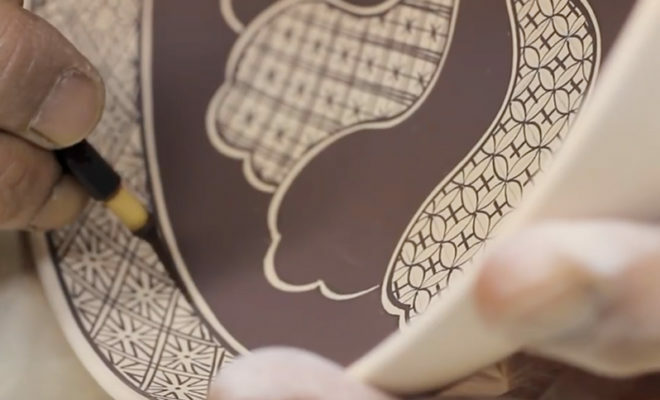 Using a tiny brush, the painter transforms the inside of the bowl into with a meticulous decoration that maintains the non-mechanical look of being done by a human hand. Want to see more? Check out how this man makes beautiful, artistic spheres using only dirt and water.